Well I don’t know about standing still (sp! 😉 ) but I do love my notebooks – most of mine at the moment are various butterfly designs from Wilkinsons, and rather sadly you can see pictures of some items here on my old blog! What is it about stationery?! It’s just so, so…yummy! Well done, that’s great. 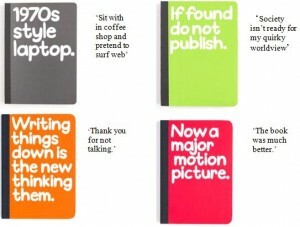 The notebooks are fab! Those are brilliant! haha I thought I was the only one who had an obsession with collecting things like that…I have more notebooks than I’ll use in my lifetime and yet still, I want more!